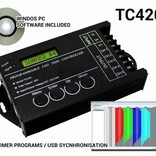 TC420 LED time controller with 5 channels of 4A. 24 hours schedule timer, perfect for sunrise effects, billboards or other time-controlled lighting. For each timed channel the brightness of the light intensity. The LED time controller then plays the program with variable timed fade-in and fade-out transitions. You can create multiple programs for all 5 channels and upload it via USB to the LED timer controller. 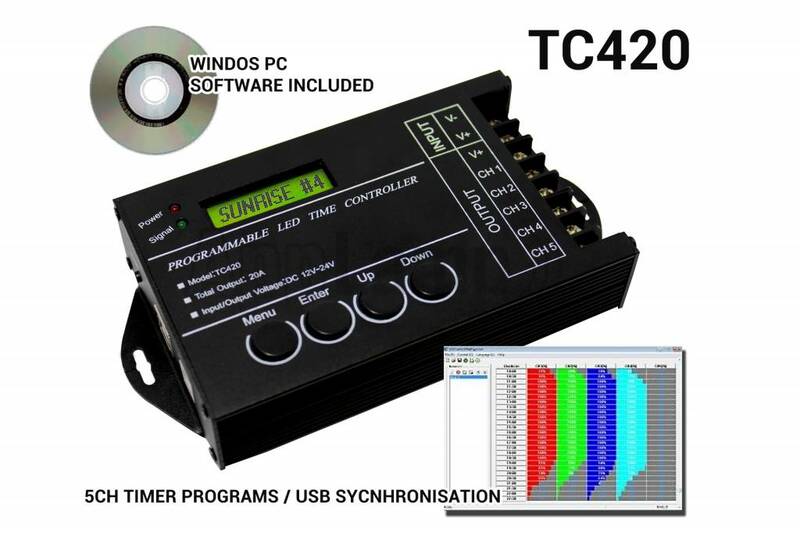 The 5-channel TC420 is suitable for both 12 and 24 volt power supplies and LED strips, 4 ampere per channel. Always choose a suitable power supply for this controller, depending on your LED strip configuration and power consumption. An RGBW LED strip + a single color strip. For example, with the TC420 LED timer / controller LED time you can make a perfect sunrise / sunset program for every season, with custom colors or sunset times per season.